Yesterday was rough. But in the end I finished the day and went to bed with the idea that the next day is new and has a chance to be better. Today started out a bit rough (complete with a night full of nightmares of photo processing…seriously. That is a new one!). But I kept at it, and kept going, and in the end, it ended better than yesterday. And that is great! And now I’m ready to go to bed soon with the thought that tomorrow is another new day and has a new chance to be better. The cycle continues. 1. listening to Dessa sing reminded me why I used to spend so much money on albums and going to concerts. I truly adore listening to her and today didn’t disappoint. Ironically, this is only the second time I have listened to her live. The first was when she and Aby Wolf opened for Ani DiFranco a while back. From Ani to Doomtree. 3. I am betting that any concert I go to around here (which hopefully will be a bit more often again) Erik Hess will be there photographing and I’ll get to chat with him for at least a bit! 4. Somehow these things have given me a sense of clarity and a stronger idea of where my next project is going. I’m not telling anymore than that yet. 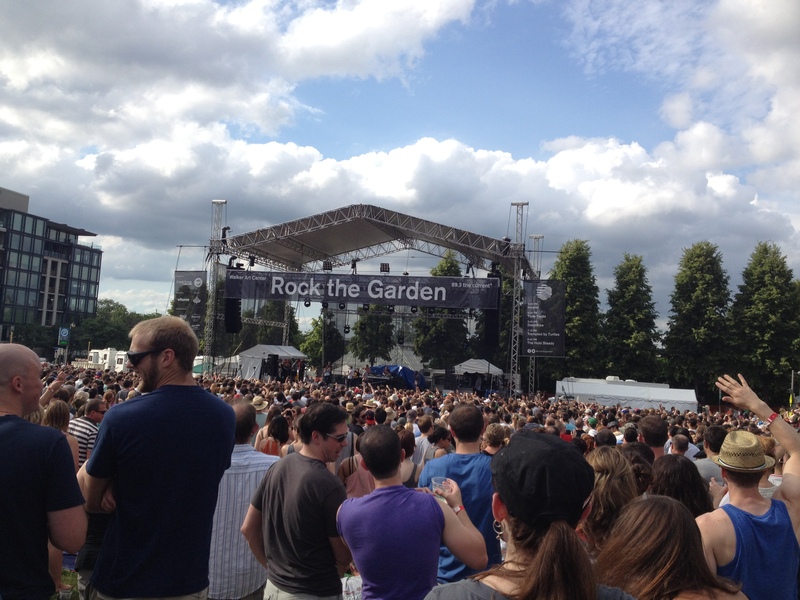 An obligatory crummy cell phone photo of the Rock the Garden stage from way too far away to make it look more than teeny – Doomtree is on there! It has been a long day though, but not in a bad way. It is time for me to curl up in bed with a book and fall asleep. It helps that I did get a new book in the mail today from Milkweed Editions. I won it from them during Northern Spark for tweeting a photo of myself at an event after midnight (which honestly is really easy to do when you are working an event all night long!). I’m anxious to start reading this book though! I promise to post a little about it when I’m done!